A new study released by Pulsar, the social data analysis platform developed by Face Group, that deep long-lasting conversations surrounding TV shows is on Tumblr, rather than Twitter. 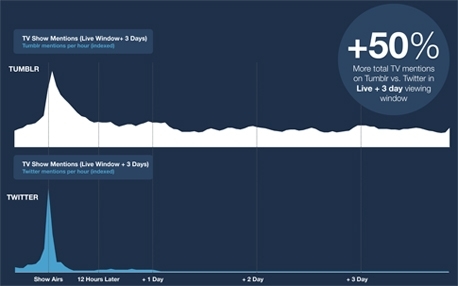 Twitter does provide higher live interactions during the hour that the show airs in generating 621,000 posts versus Tumblr’s 91,00 posts; however, Twitter conversation drops as soon as the credits roll. The study was conducted in the UK in Fall 2013, tracking discussions surrounding five TV series- Sherlock, Supernatural, Pretty Little Liars, Sleepy Hollow, and Malcolm in the Middle. Pulsar discovered that people talked about the shows more on Tumblr with 7.3 million posts, than Twitter with 3.1 million. 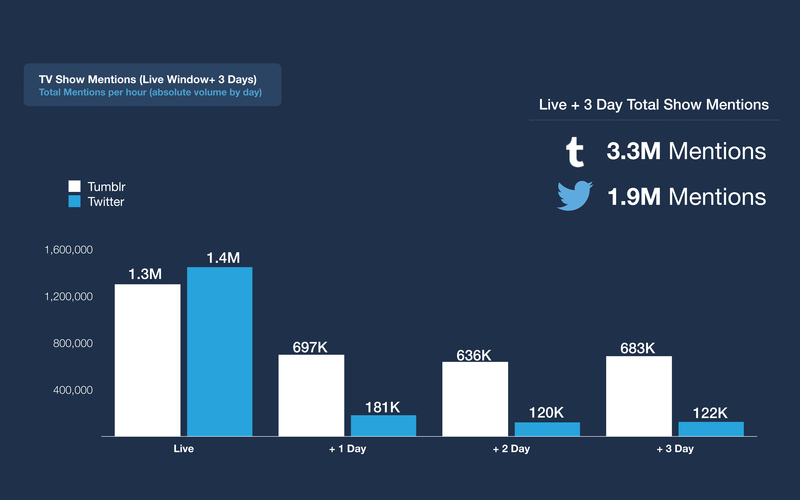 The social conversation on Tumblr grows 31% one hour after airtime compared with during airtime. Another noteworthy discovery is the type of interaction around TV content on Tumblr versus Twitter. Twitter provides an opportunity for users to share their opinions, while storytelling, content remixing, creativity, and fan community dialogue drive 71% of Tumblr TV interactions. Additionally, 41% of television related posts on Tumblr are animated GIFs of key scenes within episodes. This study will have a lasting impact on Social TV as networks will need to shift their focus to Tumblr, at least when considering long-term engagement. NBC’s The Voice has been a TV fan favorite for a long time, and it’s innovative utilization of social media throughout its history has made it a huge social engager. 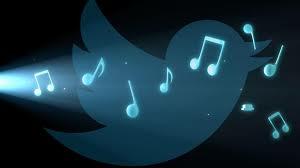 In 2011, The Voice’s biggest success was its ability to engage fans through Twitter. Although it may seem like old news now, the inclusion of Twitter into the very core of the show was a huge step in the social direction. Tweets are shown on the live broadcasts, and this is used to empower viewers and give them a feeling of direct involvement with the fate of the performers. During Tuesday night’s episode viewers were given five minutes to vote for their favorite of the bottom three artists to continue on into the Top 10. While nine contestants were saved by fans’ votes in the previous evening, the tenth contestant is saved via a live tweeting save. The hashtag #VoiceSave was used followed by the name of the singer. Viewers could watch the popularity of the hashtags #VoiceSaveTJ, #VoiceSaveDani, and #VoiceSaveTess fluctuate throughout commercial breaks. Unsurprisingly, Tess won the hearts of viewers, and she will again be performing in next week’s live shows, but looking at The Voice’s social engagement brings us to the big picture. It is not uncommon to see shows rely heavily on second screen viewer engagement. Yet this week, The Voice went social beyond just voting, and invited viewers to a Voice Tailgate. While Americans usually associate tailgates with hotdogs and beer, the social tailgate has an entirely different meaning. Using the hashtag #VoiceTailgate, “hungry fans” were given a taste of behind the scenes social content in place of hotdogs. While actual tailgate recipes are included with this event, the main goal was clearly to further engage and bring together fans via multiple social platforms including Twitter, Facebook, Instagram, Vine, Snapchat, Tumblr, and Pinterest. Involved audiences had access to behind-the-scenes content and potential on-screen mentions by Carson Daly. What does this mean for The Voice and social media? These campaigns are booming with success and bringing a whole new world to Social TV. The Voice has consistently been an innovative leader in social TV, and its results have been astounding. Looking to the future, fans can be a part of the making of The Voice through many different avenues, and the excitement and benefit surrounding this socialization of TV may only be a precursor of what’s to come in the world of social TV, highlighting the unique attributes of the intersection of television and social media. 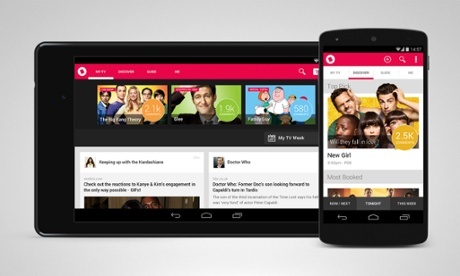 Are Social TV Companies on their way to extinction? Peel, which may have started as a Social TV company, is now focusing its efforts on its smart remote technology. Peel’s smartRemote technology turns smartphones and tablets into universal remotes. Peel’s strategic efforts in the smart remote space is exemplified through its partnership with Samsung and HTC. The Samsung Galaxy S5, released earlier this month, is preloaded with a smart remote app powered by Peel’s technology. Additionally, HTC products are preloaded with “Sense TV,” an app also powered by Peel. Peel’s initiative to be the smart remote leader is proving successful thus far. The company currently has more than 58 million activations across the globe, handling 3 billion remote control commands each month. If Peel continues to sustain this competitive strategy, they will prove sustainable in the long term. Fans of the Los Angeles Dodgers are up in arms. The team signed a massive $7 billion, 25 year deal partnering with Time Warner Cable to provide an exclusive, all Dodgers all the time channel that shows all regular season and spring training games, as well as special Dodgers programming. However, because Time Warner Cable hasn’t signed deals with any other local cable or satellite providers to feature the channel, many fans are without access to Southern California’s most popular baseball team. And the fans have hijacked a social campaign initially launched to put pressure on the local providers to give in to Time Warner Cable’s demands, and turned it around against the cable provider. 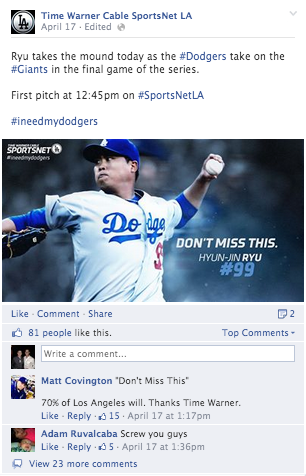 #INeedMyDodgers is the social campaign that has been featured by Time Warner Cable on-screen during games, and online on their Twitter account and Facebook page. The channel, Time Warner Cable SportsNet LA, continues to publish posts with the hashtag although fans are outraged at their parent company’s inability to reach a compromise with local affiliates. The team, projected to be one of the strongest squads in all of Major League Baseball, is facing serious backlash from its fans due to its TV deal. And their chosen network is seemingly struggling to control its own social media campaign. 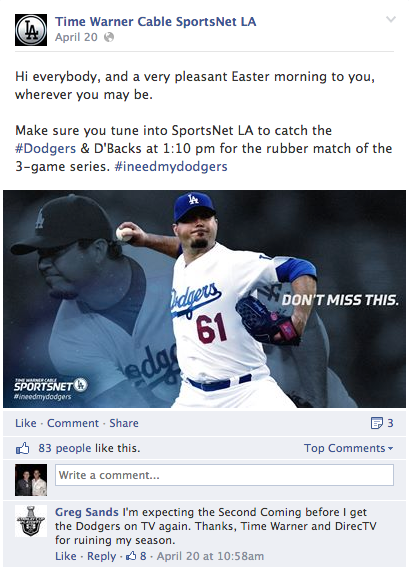 SportsNet LA is hoping that with enough fan pressure, other providers will keel over and accept their terms. They have even started a website with a fill-in form meant for fans to send to their providers in order to pressure them into a deal. But as the comments show, even that doesn’t seem to be working. How can marketers track the effectiveness of twitter campaigns? It is necessary for TV program marketers to understand when tweeting about TV programming most popular. The infographic below explains. 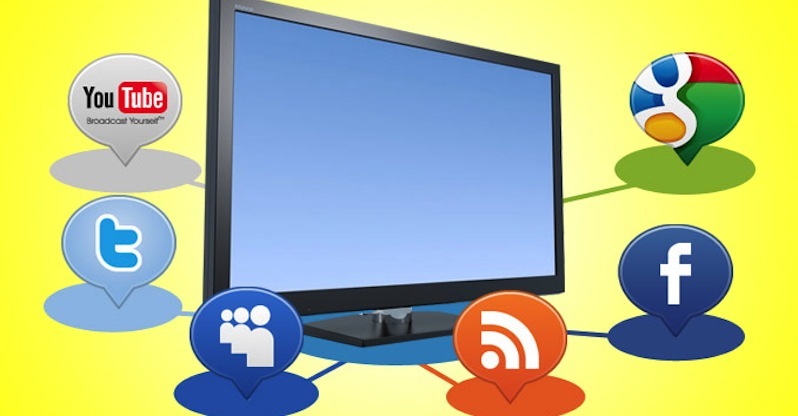 Technology companies are working to create new ways to integrate social content into multi-platform broadcast deliverables in order to further the integration into linear and live TV programming. Miranda Technologies and Mass Relevance, two such companies, are collaborating to incorporate social content from Twitter, Instagram, Facebook, Vine, Google+, and YouTube for use on any digital screen. Miranda provides production, play-out and delivery systems for television broadcasters and multi-system operators worldwide. Miranda’s on-air graphics system, Vertigo XG, creates high quality character generation, channel branding graphics, and visually engaging social media content. Miranda and Mass Relevance are two of the companies behind the scenes in managing social content and data as well as incorporating it into the templates that go on air. Live music broadcasts on television are experiencing a serious comeback, with viewers and sponsors eager to tap into the action. In the past decade, popularity of such broadcasts was declining, especially among young viewers. Recently however, live music events have pulled in massive live, at home, and digital audiences. Some recent examples of such broadcasts that have influenced conversations on social platforms include the Grammy Awards and the Beatles 50th Anniversary. 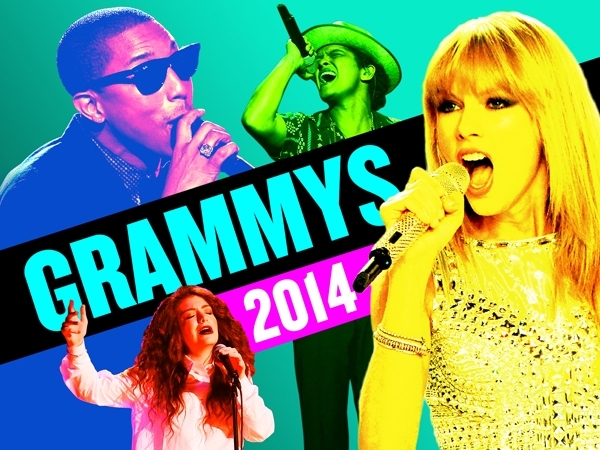 This year, the Grammy Awards was viewed by over 28 million people, one of the best showings in decades. The Grammy’s is the second most viewed of award shows, next to The Oscars, and garnered over 34 million social media interactions, a record setting accomplishment in the 2013-2014 season social events, according to SocialGuide. “The Beatles: The Night That Changed America- A GRAMMY Salute” celebrated the 50th anniversary of The Beatles’ performance on The Ed Sullivan Show. 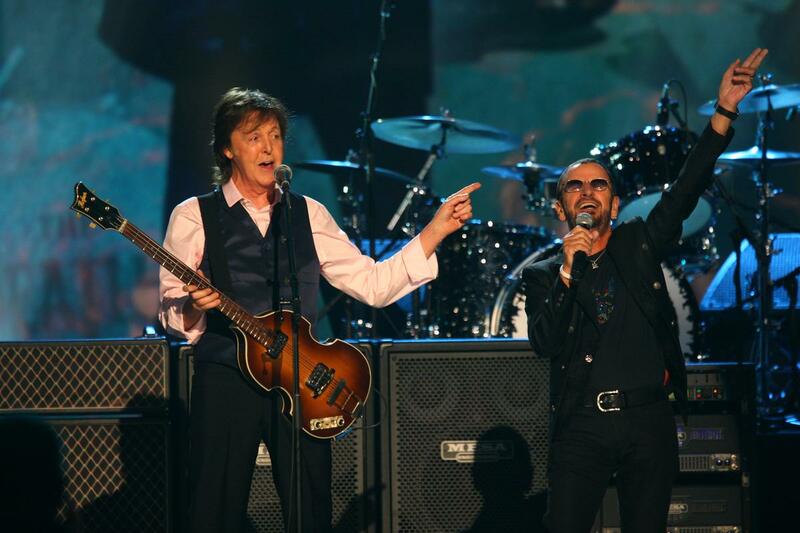 The performance by Paul McCartney and Ringo Starr was legendary and was accompanied by guest performances and presentations by Maroon 5, Alicia Keys and John Legend, David Letterman, Brad Paisley and Pharrell Williams, and Stevie Wonder (among others) making it a live music event that will go down in history. The broadcast created a lot of chatter on social media, especially on Twitter, with performers sharing sneak peaks and audience members anticipating and applauding the show. The buzz around live music airings has established these shows as prime air time for sponsors and advertisers, who are willing to allocate large portions of their budgets to these broadcasts because of the escalated live viewer engagement — CBS charged advertisers as much as $1 million for a 30-second spot during the Grammys. Music is the most-discussed topic on Twitter in America, and advertisers are aware that leveraging these audiences has the potential to receive unparalleled reach. Brands are eager to cash in on live music experiences, as research has found that live music audiences are more receptive of advertisements and sponsors than audiences at sporting events, charity events, and art exhibitions. This broadcast genre has infinite capacity, as there is always audience appetite, and hence social engagement. For more information on other live TV music broadcasts and their influence on social platforms, check out Gabirel Beltrone’s piece in AdWeek.